We've barely had the glossy white version of the Nexus 4 for a month, and now the 8GB model with its matching bumper seems to be gone. 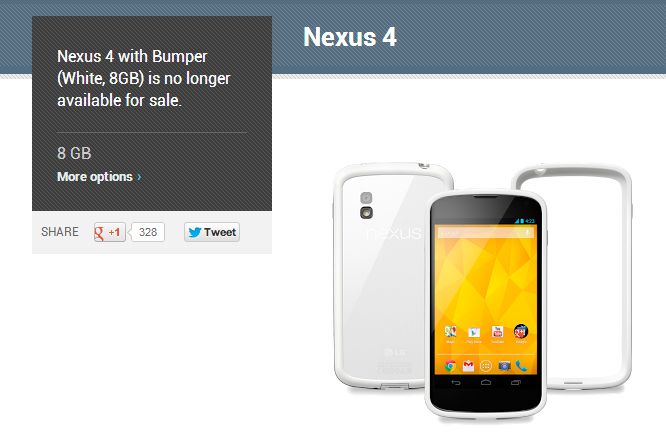 The US Play Store was just updated with the message, "Nexus 4 with Bumper (White, 8GB) is no longer available for sale." This isn't like the usual out of stock issue - the product listing looks like it's been retired. The more expensive 16GB white version (with bumper) remains available for purchase, along with both black versions. We don't know if the 8GB white model is going out completely, or if Google is just running out of its allotment of free bumper cases. (The free case promotion has always been marked as "while supplies last.") The latter is certainly to be hoped for, at least if you're a fan of the two-tone looks of the white Nexus 4. If you want a free bumper with your dirt-cheap, unlocked smartphone, you'll now have to shell out an extra $50 for the 16Gb model... which you should probably do anyway. The rest of the Nexus 4 listings are showing a 1-2 day ship time at the moment. We'll be keeping an eye on the Play Store listings, as always, and will update with any further news.